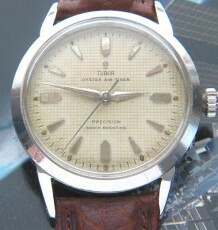 1980’s Tudor Submariner divers watch, with rare solid hands. 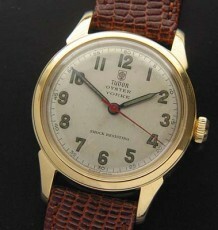 Vintage Tudor Submariner watches have gotten very difficult to buy in the last year as their popularity increases. 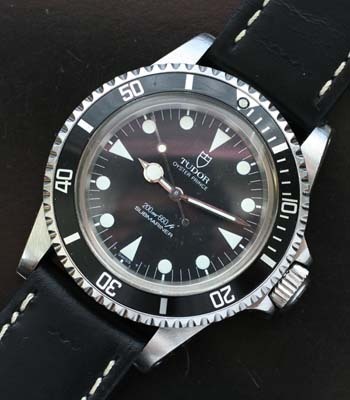 It is easy to understand why these rugged vintage watches have become scarce, they were designed and sold by Rolex using ETA ebauche movements that were upgraded and modified to meets the same military standards as the watches sold under the Rolex name. This particular model, reference 94010 came in 2 versions, one with square markers and “snow-flake” shaped hands, as well as this version produced for a shorter period of time. 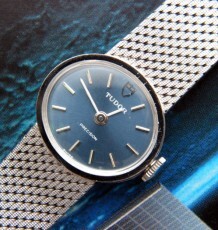 The hands on this watch feature a large round luminous disc on the hour hand, but without the usual tri-divided Mercedes star divider. These hands were only installed at the factory and were not available at the service centres for replacement. 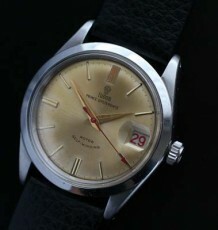 The dial is also factory original and uses the Tudor shield logo dial with the pointed luminous markers at the 3, 6, 9 and 12 o’clock positions. The watch has all the design features found on the higher priced Rolex Submariners with the added cache of additional rarity.